The Saskatchewan Roughriders and Winnipeg Blue Bombers are due — or maybe overdue — to meet in a CFL playoff game. The teams (a) that engage annually in two of the league’s most-heated rivalry games — the Labour Day Classic in Regina and the rematch a week later in Winnipeg — and (b) that have the two most enthusiastic fan bases in the league are set to meet in a divisional playoff game for the first time since 2003. When the Calgary Stampeders beat the B.C. Lions 26-9 on Saturday on the final night of the 2018 regular season, the Stamps locked up first place in the West Division. That meant the Roughriders would finish in second place, giving them hosting privileges for the Western Semi-Final. That contest, the first playoff game ever to be played at new Mosaic Stadium, is set for Sunday at 3:30 p.m. Saskatchewan is to entertain the third-place Bombers, with the winner to visit the Stampeders in the Western Final on Nov. 18. The contest Sunday will be the Roughriders’ first home playoff game since Nov. 10, 2013, when they beat B.C. 29-25 in the Western Semi-Final. Historic Mosaic Stadium also was the site of the Grey Cup game that season. The Roughriders beat the Hamilton Tiger-Cats 45-23 to claim the CFL title. The clash against the Bombers will end several lengthy droughts. The last time these teams met in a post-season game of any kind was Nov. 25, 2007, when the Roughriders downed the Bombers 23-19 in the Grey Cup game at Toronto’s Rogers Centre. The last time Saskatchewan and Winnipeg met in in the Western Semi-Final was Nov. 2, 2003, when the Roughriders won 37-21 in the Manitoba capital. And the last time the organizations met in a divisional playoff game in Regina was Nov. 8, 1975, when the Roughriders prevailed 42-24. The Bombers will be looking to end even-lengthier droughts. The last time they beat Saskatchewan in a playoff game was Nov. 7, 1965, when they defeated the visiting Roughriders 15-9 in the Western Semi-Final. And the last time Winnipeg won a playoff game against the Roughriders in Regina was Nov. 5, 1955, when the Bombers posted a 16-7 victory in the first game of a two-game total-point divisional semifinal. The lack of playoff games between the teams can be explained in part by the Bombers’ move to the East Division in the absence of clubs in Montreal (1987-94) and Ottawa (1997-2001, 2006-13) and in part by the struggles endured by Winnipeg and Saskatchewan in other seasons. 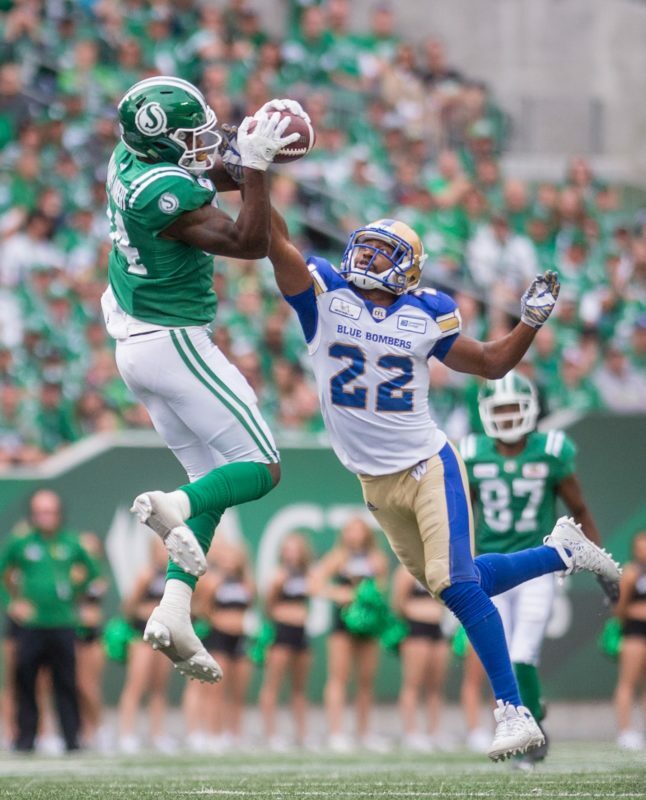 The game Sunday will be the fourth meeting of the 2018 season between the Roughriders and Bombers. Saskatchewan won the teams’ first two regular-season contests before Winnipeg won the most-recent get-together. Sept. 2 — Winnipeg 23 at Saskatchewan 31: A back-and-forth affair ended with the Roughriders winning the Labour Day Classic for the 13th time in 14 seasons. 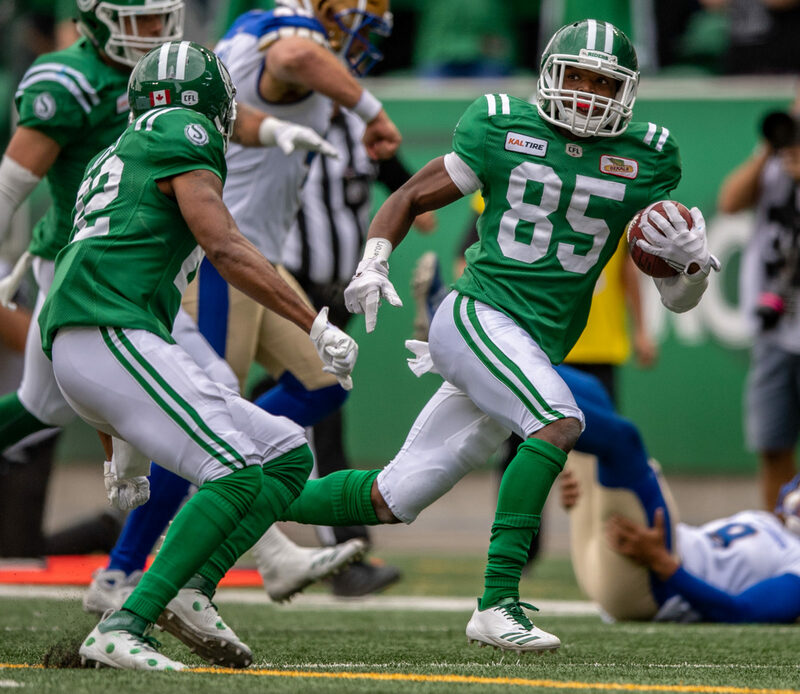 Wildcat quarterback Nick Marshall scored two touchdowns, tailback Marcus Thigpen had a TD reception and rookie Kyran Moore returned a punt 65 yards for a TD for the Roughriders. Andrew Harris led the way for the Bombers, rushing 15 times for 158 yards. Saskatchewan’s third straight victory improved its record to 6-4-0. The fourth-place Bombers fell to 5-6-0. Sept. 8 — Saskatchewan 32 at Winnipeg 27: The Roughriders’ defence stole the show in the rematch. 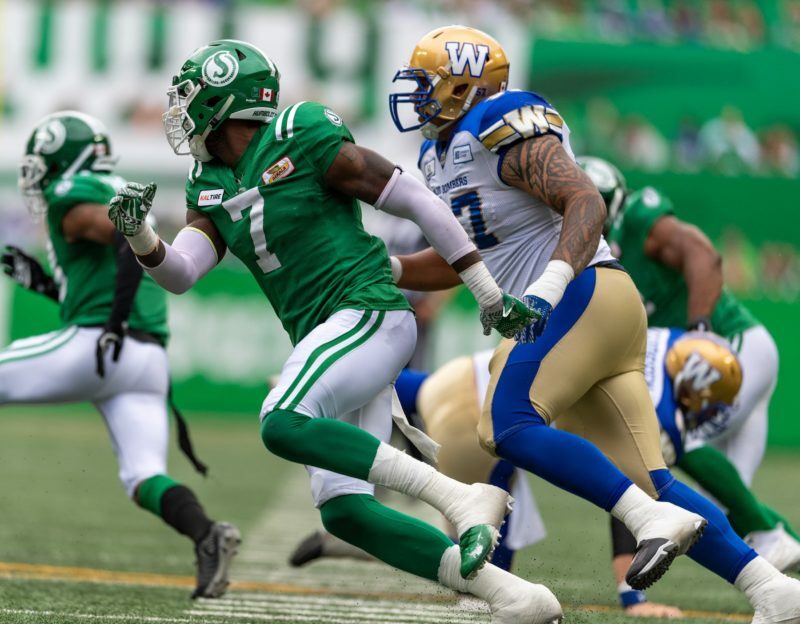 With the Bombers leading 10-0 and poised to score again, Saskatchewan defensive end Willie Jefferson snared a Matt Nichols pass at the line of scrimmage and returned the interception 97 yards for a touchdown. Then, with the Bombers up 17-13 and threatening to add to their lead, Roughriders linebacker Sam Eguavoen picked off Nichols and went 103 yards for a score. Saskatchewan finished the game with five interceptions. 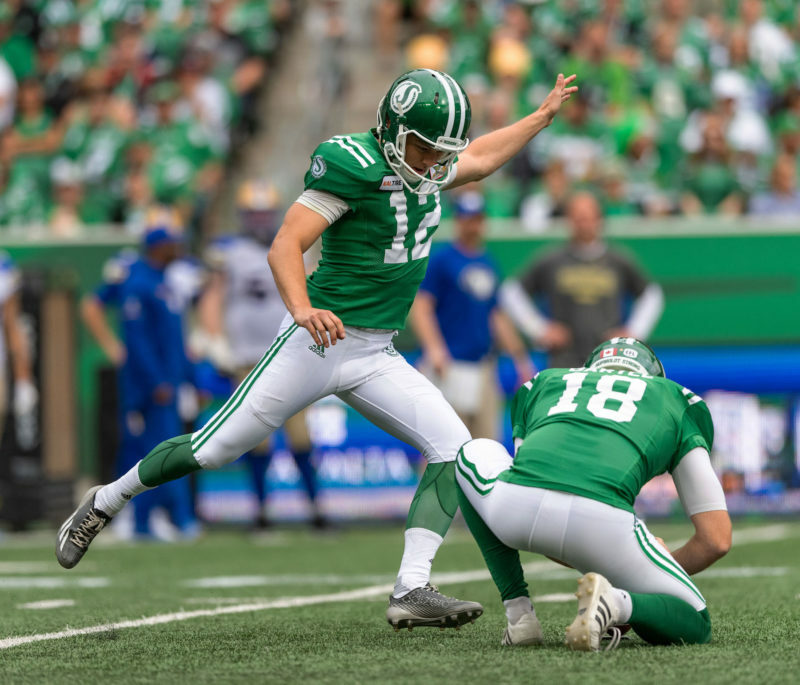 Winnipeg rallied and took a 27-26 lead, but a pair of Brett Lauther field goals down the stretch gave the Roughriders their fourth straight victory and their seventh in 11 games. Winnipeg dropped to 5-7-0 and lost the teams’ best-of-three season series. Oct. 13 — Saskatchewan 0 at Winnipeg 31: The Bombers turned the tables on Saskatchewan with a dominant defensive performance. Early in the first quarter, Winnipeg linebacker Adam Bighill popped the ball out of Moore’s hands after a reception. The ball went right to Bombers defensive back Anthony Gaitor, who returned the fumble 45 yards for a touchdown. By the time the first half was over, Winnipeg had a 31-0 lead and the score stayed that way for the duration. Bighill had eight tackles, three sacks and a forced fumble as Winnipeg (9-7-0) won its fourth in a row. Saskatchewan lost for just the second time in a nine-game span and fell to 10-6-0. Over the three regular-season games, Roughriders quarterback Zach Collaros completed 39 of 73 pass attempts for 492 yards with one touchdown and four interceptions. Nichols was 34-for-64 passing for 486 yards with two TDs and five interceptions for the Bombers, who got three TD passes (and three interceptions) from backup QB Chris Streveler. Tre Mason was Saskatchewan’s leading rusher in the series, gaining 202 yards on 36 carries. Harris led Winnipeg’s ground attack with 215 yards on 35 carries. Jordan Williams-Lambert (nine catches, 136 yards), Moore (seven catches, 110 yards), Shaq Evans (eight receptions, 100 yards) and Naaman Roosevelt (nine catches, 100 yards) were the Roughriders’ top receivers over the three games. Darvin Adams (eight catches, 192 yards, two touchdowns) and Drew Wolitarsky (12 receptions, 147 yards) led the Bombers’ pass-catchers. Mike Edem (11 tackles, one interception), Eguavoen (nine tackles, one sack, one interception for a TD) and Jefferson (six tackles, two sacks, one pick-six) were Saskatchewan’s leaders on defence. Bighill (20 tackles, three sacks, one forced fumble, one fumble recovery) and Gaitor (nine tackles, one sack, one pick-six, one fumble recovery for a TD) led the way for the Bombers.